Horse Training or Horse Abuse? You are here: Home / The Enigma / Horse Training or Horse Abuse? A 3-year-old stallion stands tied in a small, covered enclosure. His halter is hooked to a chain hanging from a rafter. The tether raises the colt’s head and neck to an awkward level; he almost appears to be on tiptoe. He tugs against the restraint, half-rearing and shuffling his feet, trying to ease his discomfort. The colt will be “hung” like this, away from food and water, all night. In the morning, body-sore and exhausted, he’ll put up much less resistance when his schooling resumes. Ordinarily, “horse abuse” conjures images of neglected backyard animals starving or thirsting to death. But there’s a subtler kind. It’s closer to home, and harder to think about. It happens to well-bred show horses, at the hands of those charged with their care. It occurs when the desire to win–or otherwise achieve a training goal–overcomes the dictates of fair play and humane treatment. Sometimes we fail to recognize it. (“It’s just training.”) Sometimes we justify it. (“Everyone does it.”) Sometimes, incredibly, we inflict it ourselves, or cause it to be inflicted by unrealistic demands. Is such abuse inevitable? The horse is one of the most willing and trainable creatures on earth. The human is the most intelligent and creative, and supposedly the most empathetic. 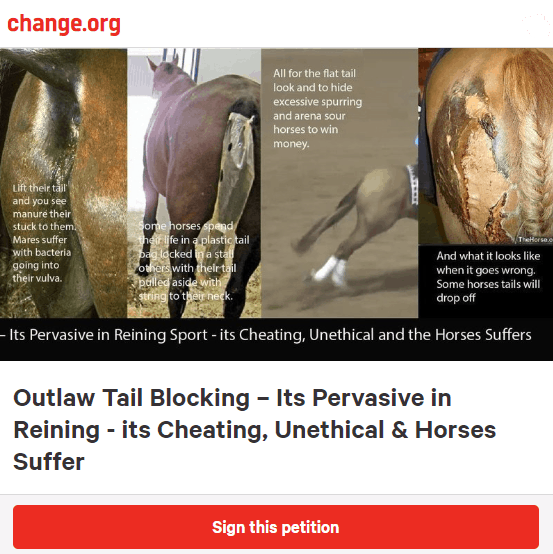 Shouldn’t we be able to persuade horses to do our bidding without abusing them? Here’s why some think not–and what you can, and should, do about it. Defining abuse in horse training isn’t as easy as it might seem. We’d all agree that proper discipline of a horse is OK, while maltreatment is not. But which is which? Swatting a horse that presents his rump to kick is clearly not abuse, while administering a 90-second “horsewhipping” undeniably is. But what about all the gray area in between these extremes? For the purposes of this article, we’ll focus on measures that most horsemen can agree are, by definition, abusive. Hang-tying to break down a horse’s resistance and promote a lowered head carriage (by exhausting the neck muscles). Riding or longeing to exhaustion (far beyond the length of time needed to “get the fresh out”). Excessive spurring, especially with so-called “rock grinders” (extremely sharp spurs), causing bleeding and/or “spur dents” (indentations in the cartilage between ribs). 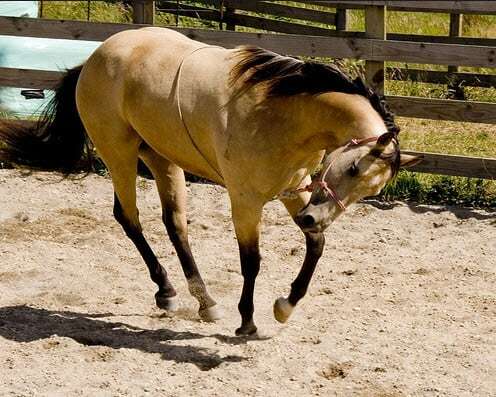 “Bitting around” for excessive periods (where a horse is left to stand for hours with his head tied around to one side, then the other, to enforce flexibility). Obviously, such measures aren’t the norm in today’s Western horse world. Yet they may be more pervasive than we’d care to think. Pressure. A trainer’s financial well-being often rests on his or her ability to win in competition. This can lead to cut corners and overstepped boundaries. Overly demanding owners add to the dilemma. Big-money futurities–which require so much of the youngest, least-experienced horses–put further pressure on trainers. Abuse may become a means to “get the job done” in the limited time available before a major event, and to make sure a young animal is “calm” enough to perform. Tough event standards. Modern trends in certain events can create training challenges that invite abuse. For example, Western pleasure’s current preference for level neck carriage, slow movement, and bobble-free correctness–all on a draped rein–places a huge burden on trainers. They must, in effect, create “Stepford mounts” that perform perfectly with no visible guidance. It’s a difficult undertaking under the best of circumstances. When difficulties do arise, observes Cole, some trainers are tempted to resort to intimidation and abuse to ensure their horses’ compliance in the show pen. The specialized nature of today’s events requires exceptional horses. When a horse without natural talent for a particular event is pointed in that direction anyway, the risk of abuse rises. But, as Cole points out, offering options is easier for all-around trainers. “If all you do is one event, you’ve got to train the horse in that event or send it to someone else,” he observes. And because a lost horse is lost revenue, single-event trainers may push the envelope in an effort to make a horse perform, regardless of suitability. Machismo. The Western horse world’s cowboy heritage means there’s a certain acceptance of “bloodletting” and a “might makes right” perspective. Frank Barnett, a Florida-based trainer who rehabilitates problem horses, points out that relying on brute force is a copout. “You’re not a real horseman until you lose your strength,” he says, noting that advancing age takes care of some brutal tendencies. “When you can no longer muscle a horse, you wind up figuring out better ways of training him,” he says. Adds Cole, “There’s only so much a horse can learn at one time. I preach this. Say you have a young horse you’ve been training for a month. He’ll be going along really well up to a certain point, but then when you ask him to go a step further, instead of getting better, he gets worse. He’s hit a wall. Collier notes that if you shoot for making your horse just one percent better each day, he’ll be 100 percent better in 100 days. “Now, that’s something worth striving for, and it rarely results in the pressure to cause abuse,” she says. Carol Harris, owner of two-time American Quarter Horse Association Super Horse Rugged Lark and with experience on the AQHA’s judges committee, says trainers must stop expecting horses to be “bionic” in execution and consistency. Some breed and sport associations, to their credit, now police their events to keep the worst offenses from occurring on show grounds. But that doesn’t stop a trainer from hang-tying a horse at a nearby barn, then hauling in to compete in the big class. Judging is a huge piece of the equation. Associations–which set standards and oversee judges–must realize what any trainer can tell you: What wins in the show pen becomes the standard, regardless of what the rulebook says. If judges were to consistently stop rewarding unrealistic goals–say, a 2-year-old so buttoned-up he won’t even glance across the arena–especially when it’s obvious the horse has been intimidated, the standard would change. Then, trainers who can achieve such ber-obedience only via abuse would no longer feel the compulsion to do so. Beyond that, don’t be shy about letting others know your feelings about abusive methods. The more that’s left unsaid, the easier it is for those who abuse to rationalize their actions. If you see obvious abuse at a show, notify a steward. If someone asks your opinion about a trainer you know to be abusive, be honest. You needn’t generalize or pass judgment; just relay any relevant information you know to be true and let the person draw his or her own conclusions. Ultimately, we all must face the reality of what goes on, and help others to do so as well. Barnett, who’s spent a lifetime studying classical horsemanship and how it applies to the most difficult horses, doesn’t mince words. “The old masters say that whatever’s painful for the horse is abusive,” he says. “I won’t argue with that, even though we’re all human, and probably lying if we say we never lose our tempers. Still, the horse-human thing is supposed to be a partnership–even if we do have, must have, 51 percent of the deal. Check his/her reputation. Talk to longtime clients and others who know the trainer well. Ask specifically about the individual’s training philosophy, whether his or her program follows a logical progression, and how he or she handles discipline. “Good trainers will adapt any program to fit individual horses or trends, but they’ll always have a foundation to fall back on,” says trainer Carol Dal Porto. Stay grounded. Don’t become starry-eyed over a trainer’s name recognition. If you’re seeking a halter trainer, for example, don’t let “shank power” (an individual’s current popularity in the show pen) blind you to abusive practices. Visit the facility. Does the trainer’s barn look safe and well-maintained, with obvious care taken for the horses’ well-being? Do the horses look happy, relaxed, and well-fed, with no raw mouths, bloody sides, or swellings on the head? Watch in particular the horses’ expression and body language when they’re around the trainer. Do the animals seem alert and willing? Or dull and robotic? Watch the ears; if the horses insist on keeping one ear obsessively cocked toward the trainer and appear fearful, it may be a sign they’re remembering–and anticipating–abuse. “Make it clear you don’t want to win at all costs, and specify the sorts of things you definitely don’t want done,” recommends Quarter Horse trainer Charlie Cole. Remain vigilant. If proximity allows, go see your horse regularly. Ask the trainer if it’s OK to occasionally drop in unannounced, for a short visit that won’t require his time. Whenever you visit, watch for the same sort of things you did when observing the trainer’s other horses. If you find anything that alarms you, discuss it with the trainer to learn of any extenuating circumstances. If the trainer seems defensive or evasive, it may be time to consider a change–for the good of your horse.